The Audyssey Audio Dock Air looks like someone has taken a biscuit tin, turned it on its side and then covered it in tactile black cloth. Its top is home to a rotary volume dial and a couple of LEDs, while on the back you'll find a proprietary power socket, plus a 3.5mm auxiliary input socket and a Wi-Fi Setup button that helps you get it ready for streaming music from your Mac or iOS device. Setting up the Audio Dock Air is pretty straightforward. You simply press the Wi-Fi Setup button, enter a few simple details about your Wi-Fi network using its browser-based interface and you're done. Once that's out of the way, the Audyssey Audio Dock Air is ready for your tunes. Luckily the biscuit tin analogy falls by the wayside and you soon find yourself enjoying a warm, bass-heavy delivery that's perfect for fans of rock and dance music. 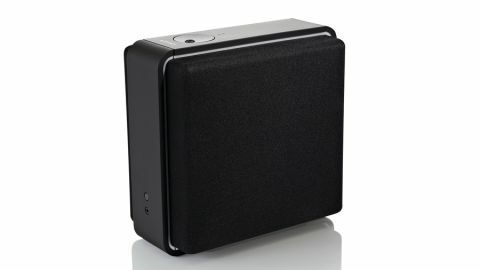 You can tighten and clean up the bass by positioning the speaker on a solid piece of furniture or even the floor. The wimpy treble is overcome by tweaking the EQ settings in iTunes, but it would have been better if the Audio Dock Air sounded great straight out of the box. You also have to keep the volume fairly low - crank it up too loud and the sound gets messy indeed.